John Smeaton had this two storey brick shop built at a cost of $2,000. The building was noted as a dry goods store in a plumbing permit dated February 28, 1895. The name at this time was the Westside. The Ideal Shoe Store’s last day of business was October 30, 1909 and the extensive renovations began thereafter. The interior was designed to emulate a High Victorian gentleman’s club. The doorway is of Mexican onyx and the domed leaded window above blends with the interior ceiling mirrors, making the store seem larger than it is. In the centre of the floor is an electrolier on an onyx pedestal. During the renovation, the original counters were replaced with mahogany ones. The exterior features glazed brick on the upper storey and a fine name plate. The interior is still remarkably intact, virtually unchanged since 1910. A visit is like walking into an early 20th century store. 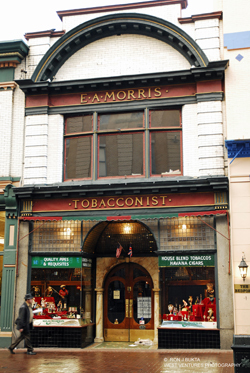 Today, E. A. Morris Tobacconist still occupies this space, although changes to local bylaws have made some signage changes necessary.